and placed them in vases and containers throughout the house. Today, you will see them in the Great Room. to either place in the recycle bin or donate them. 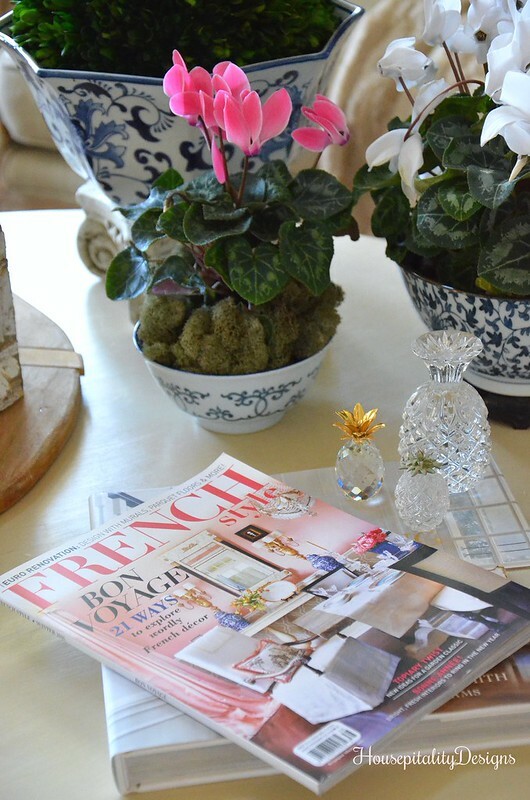 I ran across this French Style magazine and noticed all of the pink. Hmmmm. So I added pink flowers to my Trader Joe’s grocery list. 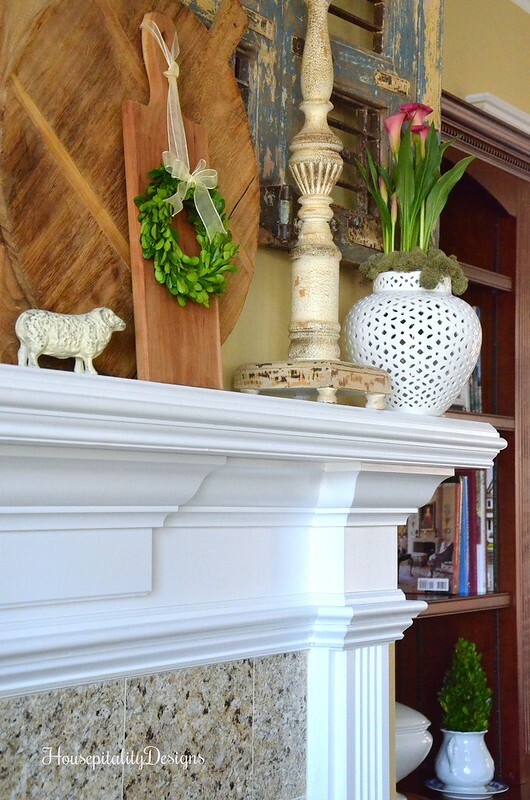 to a blue and white rice bowl to the table, I started working on the mantel. and a cast iron Ram has replaced them. into my white reticulated ginger jars. Reindeer Moss was placed at the base of the plant to hide the soil and rim of the pot. As you can see, I have not changed out my Winter pillows yet. I am searching for some pillows that will speak Spring. who was selling Avon back in the late 70’s, early ’80’s. that is on the table next to the sofa! 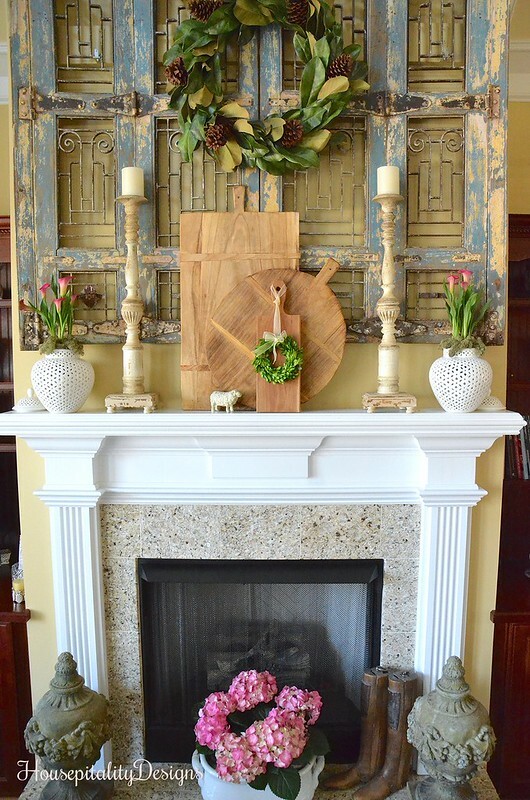 embellishment of the plants in the ginger jars on the mantel. I came across this pretty cranberry glass basket. Perfect for the white roses. that can transform the feel and freshness of a room. There will be more to come on how I added pink to my home. It’s my way of looking forward to the Joys of Spring. The Winner of the She Shed Book Giveaway is number 45, Bonnie Morgan! May you all have a most beautiful day and a Very Happy Valentine’s Day!!! 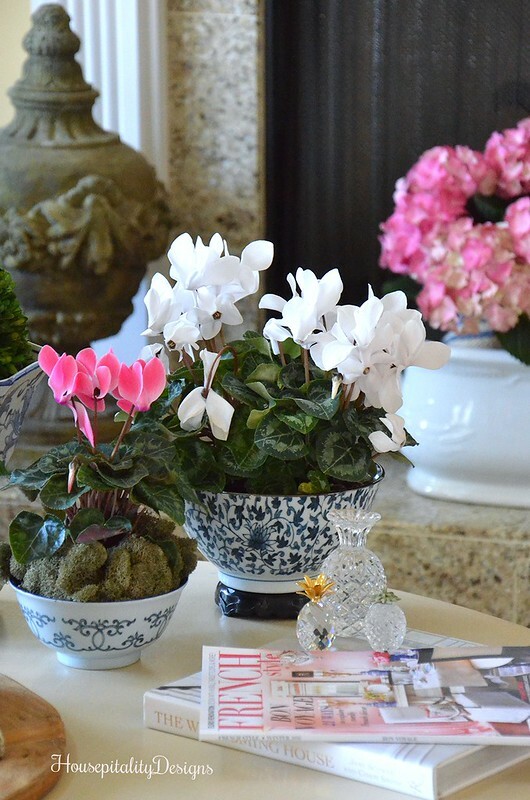 Congrats to Bonnie…the pink flowers in your gorgeous containers look so pretty and fresh. My hubby has brought home roses, tulips, and an orchid over the last few days. 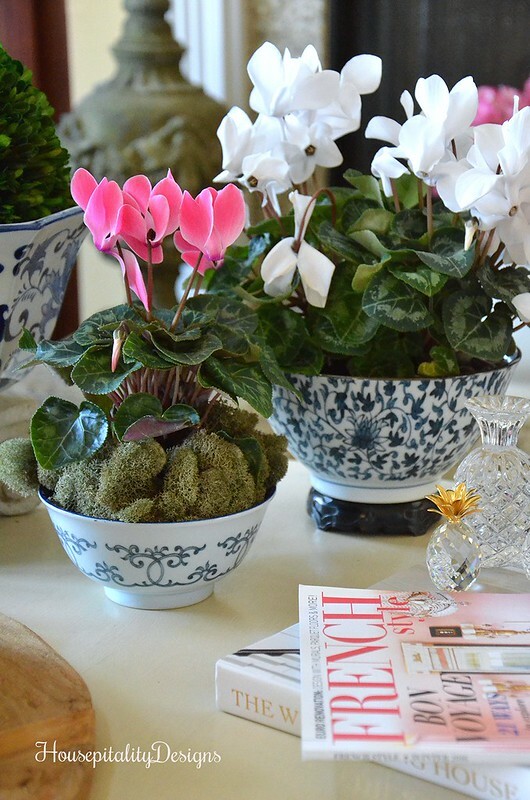 Fresh flowers add so much life to the drab winter months. Can’t wait to see the rest,Shirley…happy Monday! 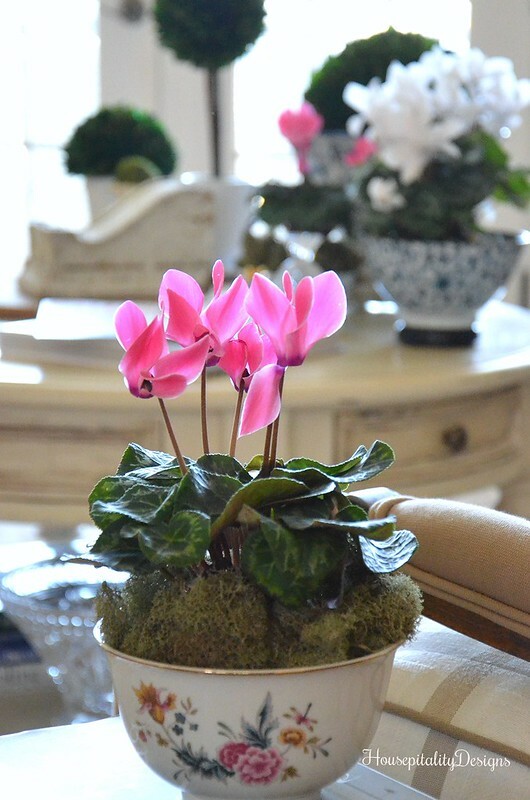 The additions of pink are nice to add a touch of spring inside. It’s already feeling like spring here and basically I feel we skipped winter. I have a funny feeling we will have winter in spring. everything looks lovely my friend. My favorite color for carnations is pink! I always enjoy visits to your lovely blog. hugs! Shirley, everything looks just beautiful! 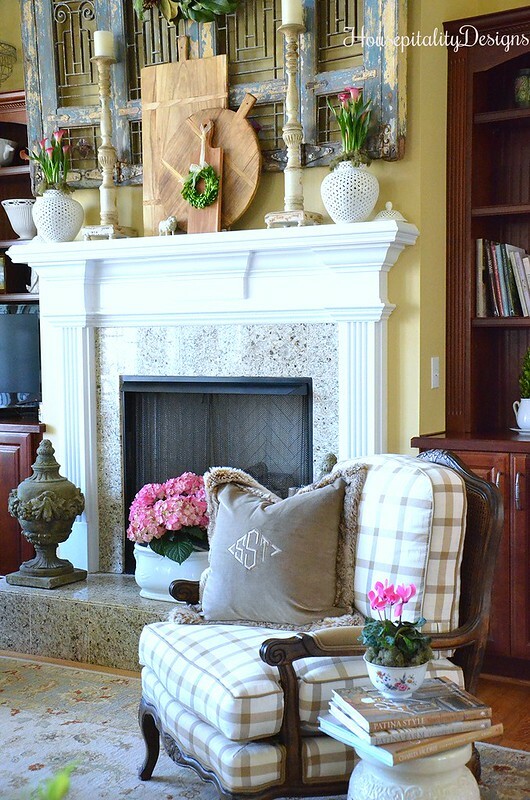 I love all the pretty flowers and the pretty color they add to your gorgeous room! It is perfect for Winter and for Valentine’s Day! Your lovely pink flowers make me want to head out to the store to buy a bunch! All your arrangements and vignettes look so beautiful! Perfect for this time of year! I’m so excited to win your giveaway, Shirley! 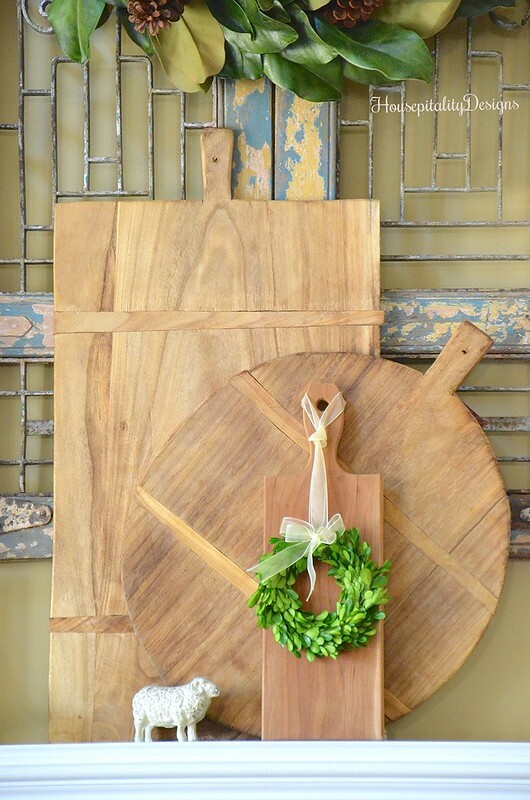 I love Mary’s potting shed and can’t wait to see the She -Shed book! Wow, that was a nice surprise this morning. Delightful post today. I love the pink in your room. Great for spring and Valentine’s Day. 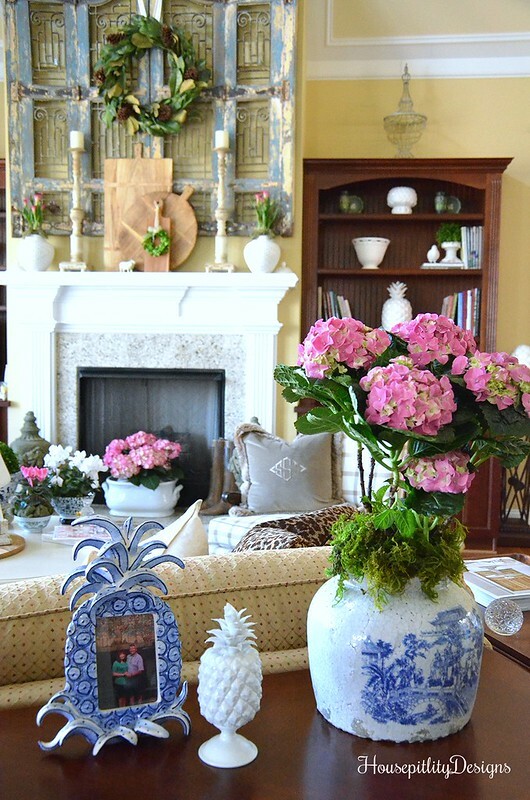 Is that a Merritt’s Pink hydrangea? My DIL’s dried to the most beautiful shades of purple. 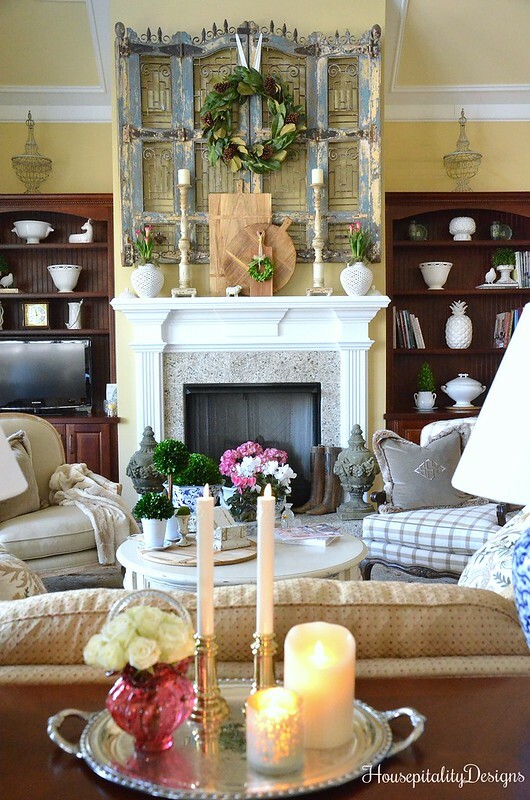 I love your additions of PINK:):) I would love to be another “pink” addition to this gorgeous room. LOVE all the flowers. I need to get to TJ’s as our grocery is very limited on the pickings:) Have a beautiful day. I am off to get my nails done and the wind is gusting to 60 MPH!!!!!!!!!! Hope I don’t get blown away!!!! 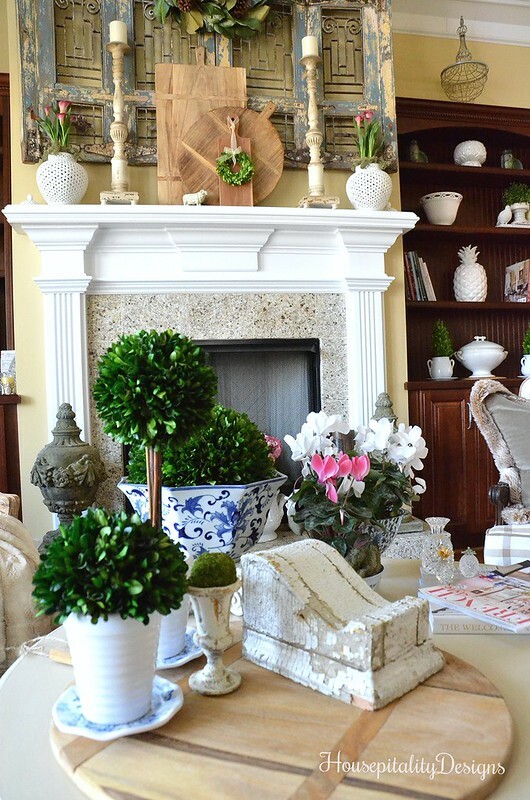 Pinky’s recent post…Brass and Blooms on the Coffee Table! Love the hints of pink! Love fresh flowers in my home too. I like to take little vases with a sprig or two and add them to my nightstand and bathroom vanities. Such a lovely post, Shirley. As usual your touch makes it all special. 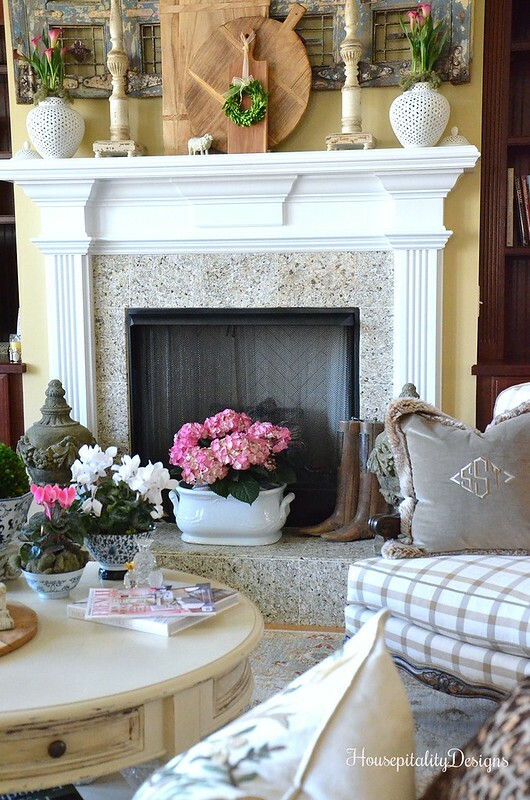 I have always been a fan of pink and the softness it adds to any room or outfit. It’s perfect for a hint of spring and always for Valentine’s Day and love. I appreciate the sweetness of this post on a “turned cold last night” Monday! Hope your Valentine’s Day is as special as as you deserve. Pretty in PINK, love it!!! If you need ideas for pink pillows I have a pillow pinterest board full of them. I still have not received my samples yet so I have not made my purchases yet either.Enjoy your beautiful pink. Everything is so pretty in pink and speaking spring! I love the pink paired with your blue and white. I’m missing having a TJ’s nearby but fortunately all the grocery stores have been in full bloom last week with lots of flowers to choose from! I had to smile at “Made in Japan . . . like me!” 😉 Congrats to Bonnie, if she had a shed it would be in full bloom just like her garden! 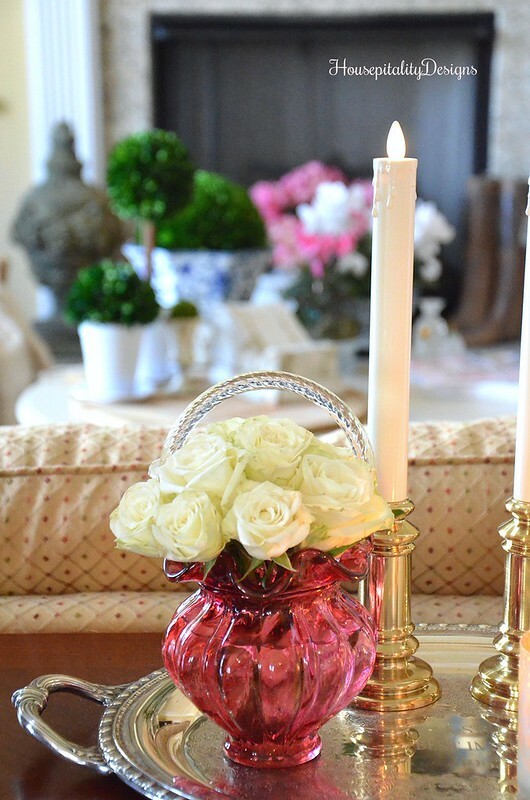 There is nothing prettier than fresh flowers, and pink ones always make my heart sing! Beautiful Shirley! Congrats to lucky Bonnie, she is going to love this book!